Our Global Gourmet recipe series is designed to bring the foods we love while traveling into our own kitchens and onto our own dinner tables. And since no meal is ever complete without a glass of wine to go with it, we’ve included wine, beer or spirit pairings as well. The key to recreating global dishes at home is to start with an authentic recipe, then adapt it to substitute ingredients you can’t find or don’t know how to work with, and simplify difficult techniques. Then it becomes more approachable and possible to make and enjoy at home. The first time I had schnitzel, I was 17 years old and visiting Germany for the first time. The restaurant had a huge variety of schnitzel to choose from and I had no idea what it was, nor did I know the differences between them all. Yes, there are a lot! I ordered the most popular – the Weinerschnitzel – which is made with veal, and I loved it. The veal is breaded and fried to form a perfectly crispy exterior and packs in so much flavor and juiciness that it’s extremely hard to resist. Over the course of the trip, I ordered as many different kinds of schnitzel as I could. As I mentioned, there are many varieties of schnitzel in Germany. A few of the popular versions are Jägerschnitzel (which is served with a rich mushroom gravy), Zigeunerschnitzel (which is served with a bell pepper sauce), and Rahmschnitzel (served with a rich cream sauce). Plus, the one we’re going to make today, Schweineschnitzel, which is made with pork. This dish is very easy to make and just takes a bit of finesse to make sure you don’t overbread or overcook the meat. To me, no plate of schnitzel is complete without some homemade spätzle on the side, so I’m going to include a second bonus recipe today for some authentic German Spätzle. Spätzle is a famous German egg noodles from the Baden-Württemberg region of southwest Germany. It’s slightly more dense than you’re probably used to and the noodles are hand-formed so they turn out looking a bit more like dumplings than Italian pasta. I love the chewy, dense texture and the pasta’s ability to assimilate into just about any type of sauce and make a perfect pairing with just about any main dish. Pairing German Schnitzel & Spätzle with Wine – and Beer! German Rieslings are a good pair for pork schnitzel because of their balanced acidity and apple and citrus flavors. The rich, buttery spatzle also calls for a wine with high acidity. A riesling from Rheingau or Mosel region of Germany is a great choice. You don’t have to be tied down to a Reisling, if it’s not your favorite. Schweineschnitzel pairs well with beer and cider, too. Since Oktoberfest in Munich is just coming to a close, I thought it would be appropriate to pair our meal with a true Marzen-style Oktoberfest beer. A Spaten and a Weihenstephaner are my top two choices. Spaten Oktoberfest Marzen was first served at Oktoberfest in 1872 and is now used for the ceremonial keg tapping by the Mayor of Munich that kicks off the Oktoberfest celebration each year. Both of these beers are full bodied with a strong malty flavor, but they aren’t bitter or overpowering, so they play well with many different foods. Here are some options that you might find in your local wine store. If you can’t find these, ask your local wine expert to suggest something similar. 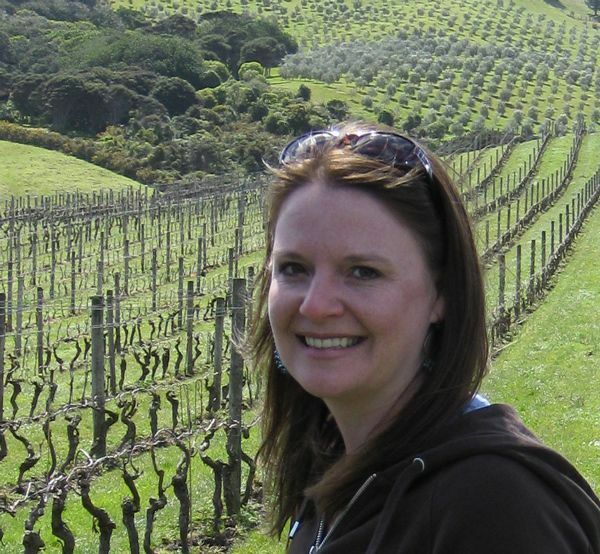 We frequent a local store in Seattle called Downtown Spirits, so I ask their wine director and expert Shelly Fitzgerald to weigh in with her suggestions. I’ve never been led astray by her expertise. For some reason, I tend to choose recipes that involve making pasta or dough. Perhaps all of the really great recipes from around the world are made with those components. In any case, it’s incredibly easy to make pasta dough, so it’s not an issue. I know a lot of people think it’s difficult or are scared to try, but if you do, you’ll see how easy it is. 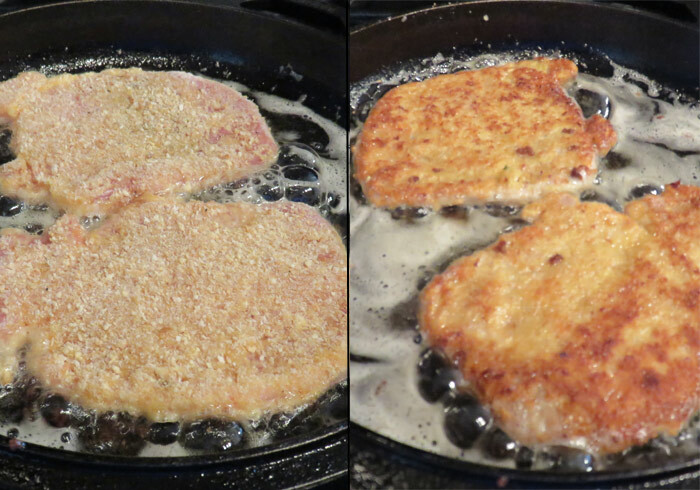 For the schnitzel, you need really thin pieces of pork (or any type of meat you choose) so they get nice and crispy on the outside without burning, but are cooked through in the center. For this, I buy boneless pork chops and pound the meat down to about 1/4 inch with a meat tenderizer. Pound the pork to about 1/4 inch thickness. To set up a dredging station, you’ll need a plate for the flour, salt and pepper, a bowl for the lightly-beaten egg, and another plate for the breadcrumbs. Use one hand to dredge the pounded pork through the flour. Shake off any excess. Then use the other hand to dip the pork in the milk bath. Shake off any excess. Then dredge the pork in the breadcrumbs to coat the outside. Shake to remove any excess crumbs. You don’t need to pack on any extra crumbs. You want it to be coated just once and have no excess. Add the pork to the heated oil and cook until it’s browned on both sides. Heat about 1/2 to 1 inch of canola or vegetable oil in a medium skillet until it reaches 325 degrees on a thermometer. You really want the oil to remain at 325 degrees so it cooks the pork evenly without burning the crumbs, and so the breading doesn’t soak up too much oil. If you’re able to keep the temperature even, you’ll end up with a perfect piece of schnitzel. When the pork has been fried on both sides, remove it to a paper-towel lined plate for a moment to rest. Now, if you’re eating the schnitzel and spätzle together, you’ll want to load the buttery (or cheesy) spätzle onto the plate, place a piece of the schnitzel on top and garnish with a spring of parsley and a slice of lemon. Bon appetit! For the spätzle, you will be amazed. It’s the simplest thing to make. Combine the flour, salt and nutmeg (if you like it) in a large bowl, or a KitchenAid mixing bowl, then add the beaten eggs and milk. Sometimes you don’t need quite all of the milk, so maybe add it slowly so it doesn’t get too wet. Since I like to make the process as easily as possible, I used my KitchenAid to mix the dough. Just attach the dough hook and allow it to mix on speed 2 for about 5 minutes and you’re done. All dough benefits from a short resting period, so it’s best to let this one rest for about 15 minutes, if you can. The only issue is that you need a spätzle maker to form the noodles. Well, technically you don’t, but it does make it quite a bit easier. There are a couple of options. You can use the Norpro Spaetzle Maker, which looks similar to a mandolin with a press for making the noodles. Or you can use a Spatzle lid and scraper, which can be placed directly over the pot of boiling water. Both work just as well, so it’s just a matter of preference. If you’re creative, however, you can make the noodles using some common kitchen gadgets that you probably already have. A colander with large holes, a cheese grater, or a slotted spoon would all work. They might form strange-looking dumplings, but they taste the same, so no big deal. I ended up using a decorator bag with a small tip and just squeezing and cutting the dough into the water. It worked great for me. If you don’t have any of those things around, just get creative. Anything with holes that you can squeeze the dough through will work. If you must, rolling out the dough into thin threads and cutting it will also work. The pasta needs to cook in a near boiling water for about 3 minutes. It will float to the top when it’s done. If you overcook it, it will be a little more chewy and dry. When you remove it from the water, drain it, then either run it under cold water or submerge it in an ice bath to stop the cooking process. You can then either saute it up with some butter, add cheese to it, or even put it in the fridge or freezer for later. It keeps for about 5 days in the refrigerator. There are so many ways to serve spätzle. It really depends on what you’re serving it with and how you prefer to eat it. I really like it just tossed with some butter and parsley and served alongside the schnitzel. Add the spätzle to a skillet with some melted butter and toss to coat. Super easy. Another really popular way to eat spätzle is with cheese. The recipe is called Käse Spätzle. It’s a Southern Germany specialty. Really, it’s just a German-style mac ‘n cheese. It’s usually made with a swiss, emmanthaler, gouda or edam cheese and served with crispy onions on top. The dish is also served in Hungary, Austria and Switzerland — and now my home and yours. It’s super easy to make – basically you just add cheese, bake and stir. Place the pork chops onto a cutting board. Cover with a piece of plastic wrap. Using a mallet, pound the meat down to a uniform 1/4 inch thickness. Season the meat with salt and pepper. Dredge the pork in flour, then beaten egg, then breadcrumbs. Shake between each dredge to remove any excess. Add approximately 1/2-1 inch of oil in a large skillet and heat to 325 degrees F.
Place the dredged pork pieces into the oil and cook on each side for about 2-3 minutes until they display a deep golden brown crust. Transfer briefly to a paper-towel-lined plate. Serve immediately to preserve crispness. Bring a pot of salted water to a strong simmer. Push the dough through a spaetzle maker, large-holed colander or grater to form the noodles. Drop them directly into the simmering water. The noodles will float when done, about 3 minutes. When done, drain the noodles in a colander, then submerge in ice water to stop the cooking process. Toss the noodles in a sauce pan with melted butter and parsley and a pinch of salt to taste. This entry was posted in Recipes and tagged Germany, Global Gourmet. Great post! I always make schnitzel for my birthday, that is, I did until I moved to Turkey! Thanks for linking my blog post on Kase Spaetzle! Thanks for stopping by, Terry. Your post and recipe is great so I was happy to link out to it. Hopefully a few folks will try your delicious Kase Spaetzle. Oh my gosh, this looks delicious!! I love a good Oktoberfest, but often overlook the pairing power of a good Reisling. I’ll have to be more open to it in the future. Sounds like an amazing pairing! I’m gonna have to try it out for myself in celebration of Oktoberfest! LOVE, LOVE, LOVE this post! Since becoming a perpetual traveler I’ve been unable to have Spaetzle and Schnitzel. My mother is Ukrainian and German and this was part of my cuisine growing up. Top it off with a great wine and I’d be in heaven. Thanks so much for bringing back such fond memories! You’re welcome, Marie. The whole point of my pairing series is to bring those tastes we love from traveling home with us, so I’m glad I could do that for you. Well, now you know! Was it good on the plane? Looks like a great food item. Dooes it have a veggie version as well. Spaetzle is vegetarian. I suppose you could make an eggplant or portabella mushroom schnitzel but I’ve never tried it. great post! And thanks for sharing the recipe, i’ll be trying it out asap. That’s great, Maria! I’m hoping you try it. Really, it’s super easy to make at home. Yum! Sounds amazing! Thanks for the recipe – am going to try this at home. Loved our time in Germany, and a Jägerschnitzel with a side of rich mushroom gravy sounds right up my alley. Will try and find a recipe for the gravy now too :D! The mushroom gravy is awesome. I hope you find a good one and try it. Bring a little bit of Germany home with you. This looks delicious–thanks for sharing the recipe! We just had some schnitzel and spätzle the other day, so it would be fun to make it at home now. Thanks for the pairing suggestions as well. I always have a hard time figuring out good pairings! I enjoy pairing food and wine and I get a lot of helpful tips and suggestions from my local wine store – that always helps! I’ve always wanted to try making a traditional german dish but I just haven’t done it. I’m going to try this recipe and report back to you! Love the beer pairing too. Mia, I hope you do try it and let me know. I didn’t realize how easy it was to make at home until I tried. That’s the best part about Oktoberfest. You don’t have to like beer to enjoy it. There are so many other things to do, see and eat!